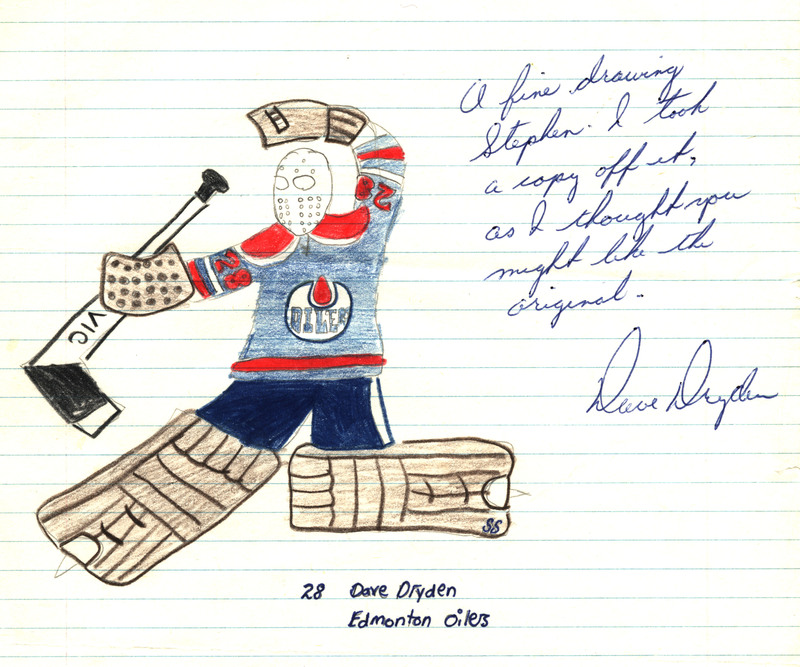 I would have been ten or eleven when I mailed my drawing of Dave Dryden to my grandfather in Edmonton. 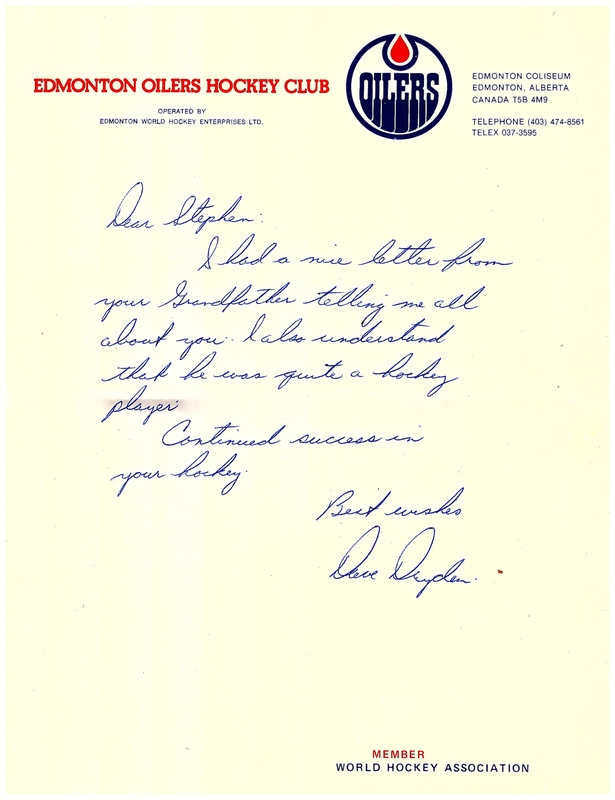 I don’t know if I knew that he’d pass it on to the Oilers’ goaltender, who then returned it to me with a nice letter and a team photo. Could be that that was my plan from the start. Or possibly I was surprised and, while pleased for the recognition and the autographs, puzzled at the same time: my grandfather didn’t want my drawing for himself? Noted: I would have been ten or eleven when I mailed that sketch to my grandfather in Edmonton. I don’t know if I knew that he’d pass it on to the Oilers’ goaltender, who then returned it to me with a friendly letter and a team photo. Could be that that was my plan from the start. Or possibly I was surprised and, while pleased for the recognition, swag, and autographs, I may also have puzzled at the same time: my grandfather didn’t want my drawing for himself? These were WHA Oilers, the 1977-78 edition. 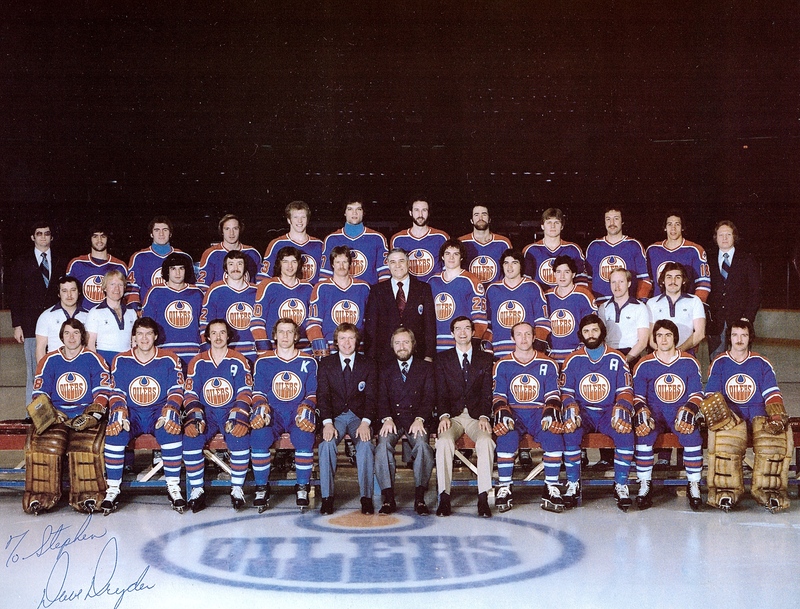 Glen Sather was the coach: he’s in the front there, next to owner Peter Pocklington. Dryden is on the far right, above his signature. Notable skaters included Paul Shmyr (wearing the captain’s ostentatious K); Bill Flett (front row, bearded); and Dave Semenko (back row, sixth from the right). Edmonton lost in the first round of the playoffs that season. They fared better the following year. Pocklington’s purchase of a 17-year-old Wayne Gretzky helped the Oilers top the regular-season standings. In the playoffs they made it to the Avco Cup championship, though they lost there to the Winnipeg Jets. That was all for the WHA: the year after that, the Oilers and the Jets were NHLers.